Durango, Colo. — Caddis Aerial’s land surveyors Daryl Crites and Steve McCormack have added LiDAR as a capability to their UAV survey offering. 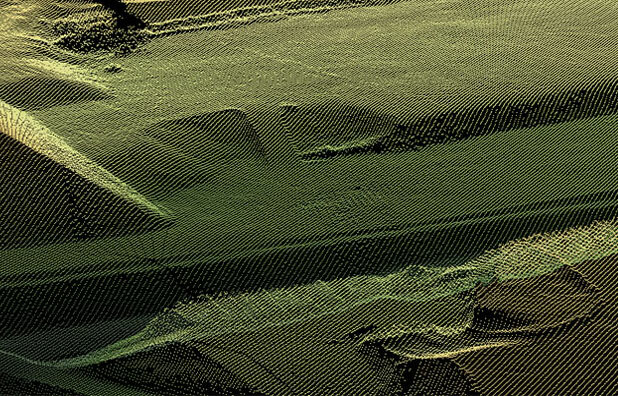 Partnering with turnkey UAV LiDAR solution experts Routescene Inc., who are also Colorado-based, this enables Caddis Aerial to perform high-resolution and vegetation-penetrating surveys in the Four Corners area of the Western U.S.
Their first joint project took place at the end of 2018 at a Native American archaeological site in Sand Canyon, Colo., and exciting new discoveries were found through the vegetation. These dramatic results were due to utilizing Routescene’s rigorous survey workflow starting with survey and project planning, data acquisition, data processing to the final bare earth outputs. The team had immediate and continuous real-time in-flight data quality assurance using Routescene’s QA Monitor web-based software, making sure they left the remote survey site with the data they needed. Using their proprietary software, LidarViewer Pro, and the Bare Earth tool, a bare earth terrain model was extracted which enabled the archeologists to instantly identify artefacts. Caddis Aerial and Routescene Inc. will operate their service across the Four Corners, focusing on applications where their expertise and technology is most beneficial: including monitoring slope stability through vegetation to prevent mud slides, surveying vegetation encroachment of power lines to prevent fires, to hydrological modeling to prevent flash floods. Routescene Inc. will be exhibiting at 2019 International LiDAR and Mapping Forum in Denver, January 28-30.